The Blues eased through to the quarter-finals following a thumping 14-0 triumph over Eastleigh at the PMC Stadium. There were nine different scorers in what was a crushing cup victory. Daisy McLachan hit a hat-trick, while Rachel Panting, Jade Bradley and Sarah Eadon netted doubles. Emma-Jane May, Esther Anu, Danielle Rowe and Eilidh Currie all struck. Eastleigh's Kat Littleboy put through her own net to complete the scoring. That win has now set up a thrilling last-eight clash with arch-rivals Southampton, who Pompey drew in Monday’s draw. And Blues boss Sadler is targeting an 11th-successive Hampshire Cup win this season. He said: ‘It’s massively important (to have a run in the cup). ‘It brings fresh opportunities for players, it builds up momentum and this is a cup that is steeped in tradition. 'The club have won this competition 10 years on the bounce and 14 in total. Pompey went ahead early on through May and never looked back. Hat-trick hero McLachan struck twice before the break to make it 3-0. Sadler's side showed a ruthless streak after the restart, netting 11 more goals. Anu's curling strike started what turned out to be an onslaught. Soon after McLachan was on hand to complete her treble before summer signing Rowe netted her first Blues goal moments later. It was Panting's turn to get in on the act, then Currie struck to make it 8-0 still with over 20 minutes to play. 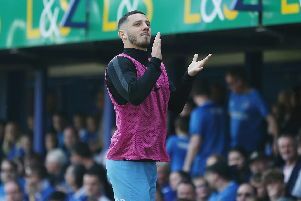 Substitute Bradley extended Pompey's lead minutes after being introduced. Eastleigh's Littleboy turned Carla Perkins' cross into her own net as the Blues racked up double figures. There was still time for Eadon (two), Bradley and Panting to strike, wrapping up a resounding 14-0 triumph. Blues boss Sadler was delighted with the ruthless edge his troops showed. He added: ‘Credit to Eastleigh, they came and wanted to play football. ‘But we matched everything they did and more. ‘I think our high pressure was superb. ‘We won the ball back and we turned it over. ‘Our inter-play in and around the box was immaculate and I was really pleased. ‘I was really pleased for some of the girls coming back from injury, with Jaz (Younger) coming on and getting some minutes. ‘I think the whole backline, including (keeper) Robin (Levett) were superb. ‘I don't think she touched the ball with her hands. Pompey return to FA Women’s National League southern premier division action at Cardiff Ladies on Sunday (2pm). The Blues have signed Northern Ireland talent Alex Collighan. Collighan, 17, has been handed the number 19 shirt, after joining from Chichester City. Speaking following her arrival at Fratton Park, she said: ‘I’m delighted to have signed for Pompey Women.